Print the following page and use it to check off the operations you have completed while performing the system setup according to the instructions in this chapter. Please be sure to perform all of the operations in the order designated (all of the boxes must be checked), otherwise the service will not work. Enter company data under Company. 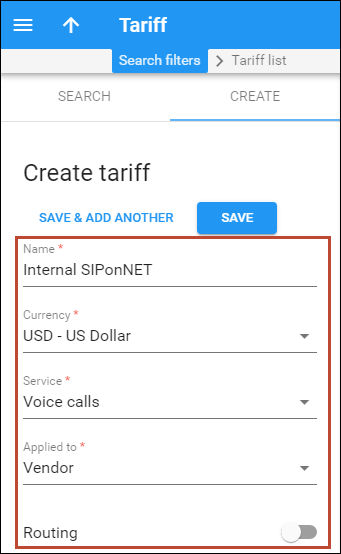 Create internal tariff, which describes your termination costs for SIP-to-SIP calls and for calls to the PortaSIP® Media Server. Make sure it is NOT a Routing type! The following steps are normally performed only once, after the system is installed. 1. On the navigation menu to the left, select My company and click Company info. · Company name – The conventional form of your company’s name (e.g. “Demo system”). · Base currency – The company’s internal currency is predefined when creating a new PortaBilling® environment. 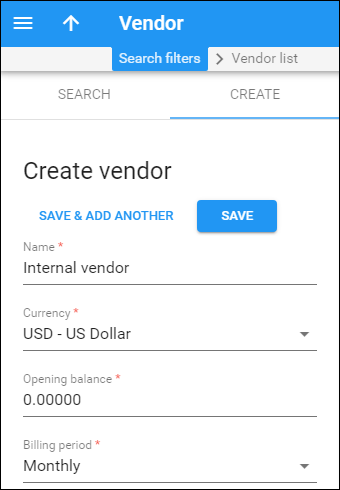 You can use different currencies for your customers or vendors, but Cost / Revenue Reports will be generated in this currency. · Time zone for global reports – Time zone in which global reports for the environment (e.g. Cost / Revenue Report) will be generated. · Reconciliation period – How frequently the global reports (e.g. Cost / Revenue Reports, the report about xDRs for calls which were not identified as crossing any connection to a vendor) will be generated. · “From” email for outgoing communication – An email address that will appear in the From: field of all outgoing emails, e.g. statistics / invoices or low credit warnings sent to your customers. · In the Contact info for invoices section enter contact information about your company that will be used on reports as the primary point of contact for your vendors and customers. This information is the same as that which appears on your letterhead and business cards, for example. · Contact email – An email that your customers can use for contacting you (this email can be added to an invoice template and thus appear on issued invoices). 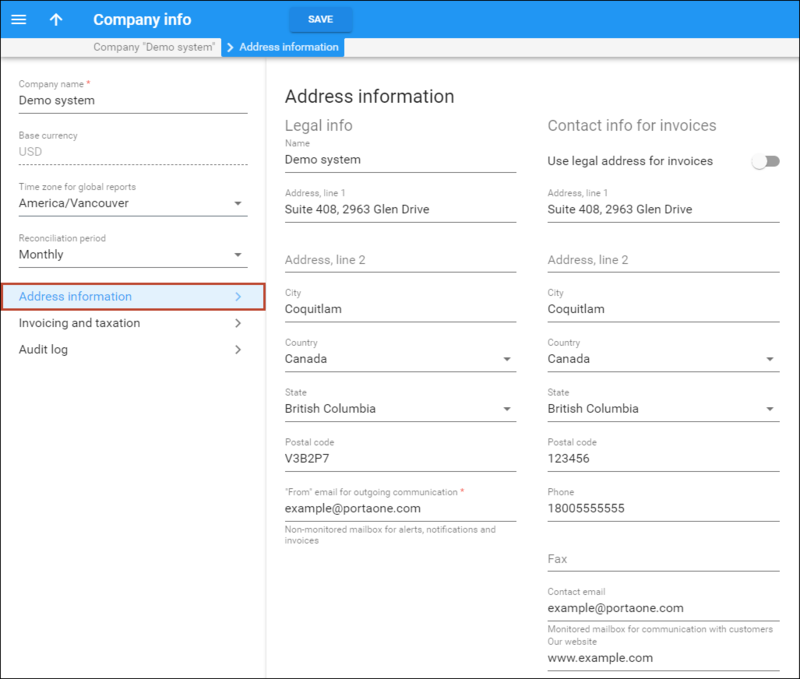 Click the Use legal address for invoices option to use your legal company address. · Invoice number sequence – Sequencing level for invoice numbers. 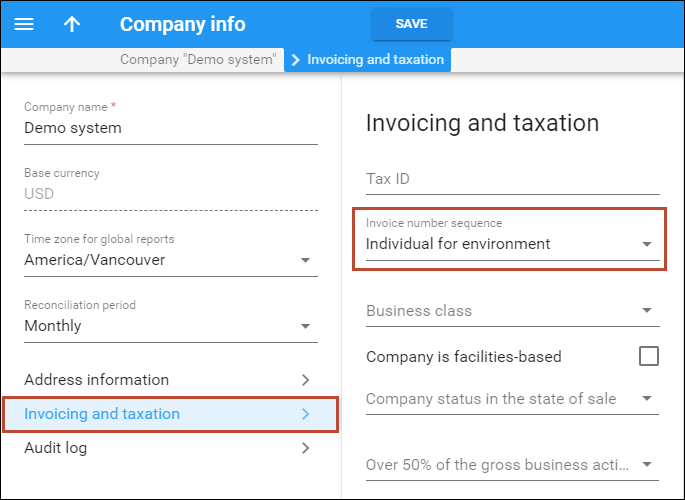 o Individual for environment – Sequential invoice numbering throughout the environment. o Individual for reseller – Sequential invoice numbering throughout the environment for direct customers, distributors and resellers, though the reseller will have their own sequential numbering for all of their customers. o Individual for customer – Every customer (direct customer, subcustomer, distributor, and reseller) will have their own sequential numbering. It is not recommended to use the default PortaBilling® root user (<env>-root) for any operations other than initial setup. That is why you need to create at least one new user with root permissions. 1. On the navigation menu to the left, select My company, then Access control, and click Users. · Login – Type a username that will be used by this user to log in to the admin interface. · Email – Type an email contact for this user. The user will receive notifications for which they are subscribed via this email. · Password – Type the password for this user. · Role – Select Root for this user. You may configure additional parameters for a user as well. As an example on how to configure the notifications, please refer to the Managing notifications using templates section in the How to… handbook. For more information about available fields, click at the top-right corner. Make sure that you are able to log in as the newly-created user, and change the password for the <env>-root user. If you plan to do billing in multiple currencies, define them and specify exchange rates on the Currency management panel. 2. On the navigation menu, select Financial, and then select Currency management. · A bulk update, by uploading destinations from a file. · One-by-one on the web interface. NOTE: PortaBilling® supplies a file with a default destination set which you can download and then upload to the server. However, it is possible that your business requires different types of prefixes, so please check the data in the file before uploading. 2. On the Destination panel, click Upload. 3. 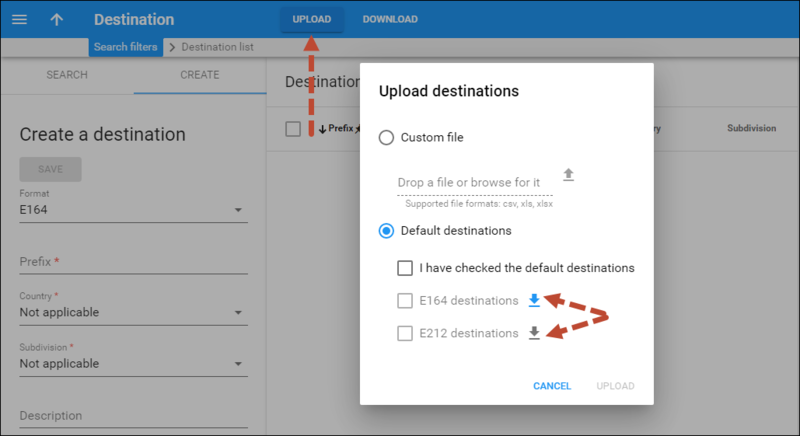 In the Upload destinations dialog box, select Default destinations. 4. Click the button to download a set of destinations as a .csv (comma-separated values) file. NOTE: PortaBilling® supplies a file with a default set of destinations in the E.164 format. To download a set of destinations, select the E.164 format on the Upload destination dialog box and click the button. Repeat these steps to edit and upload the file with destinations in the E.212 format. 5. 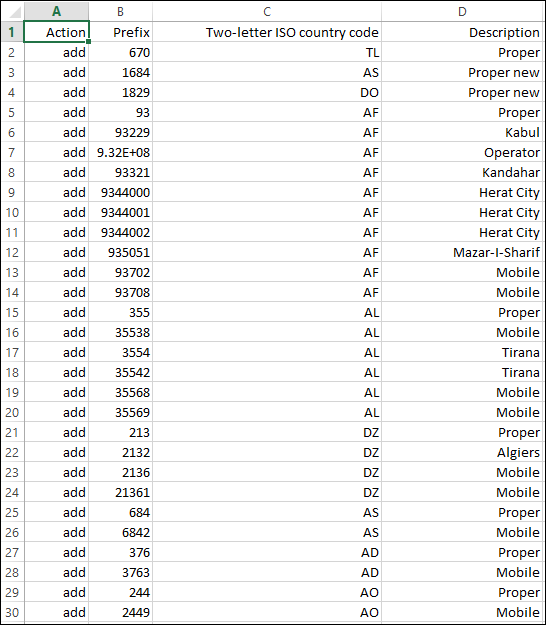 Open this file in Microsoft Excel or any other suitable program and verify that the list of destinations is correct. 6. Switch back to the PortaBilling® admin interface. 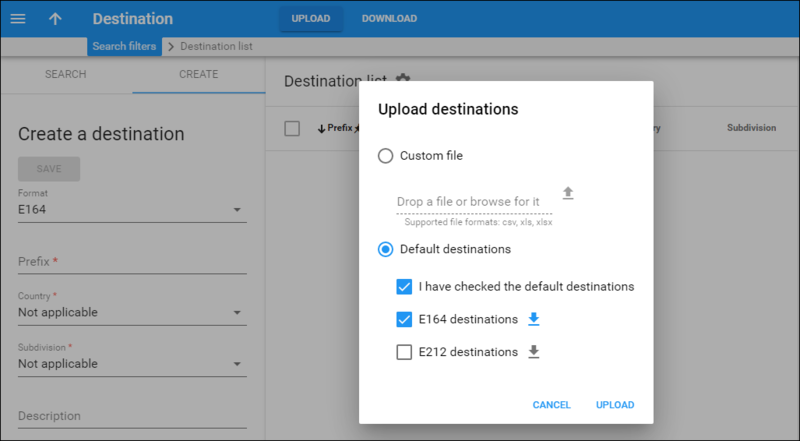 In the Upload destinations dialog box, select the I have checked the default destinations and E164 destinations check boxes and click Upload. 1. On the Destination panel, click Upload. 2. 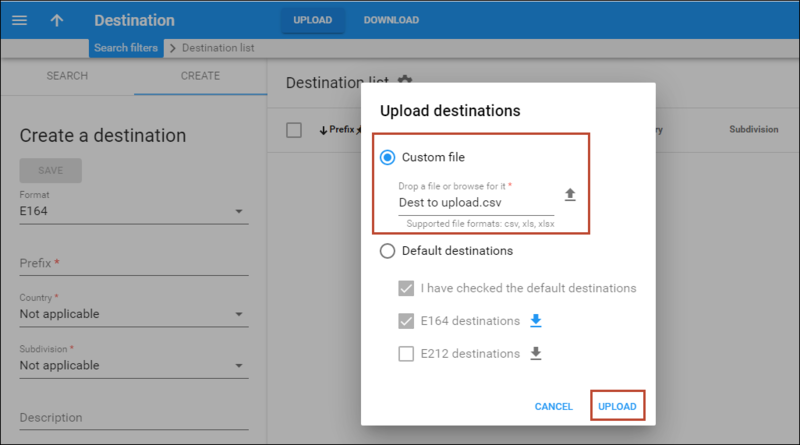 In the Upload destinations dialog box, select Custom file. 3. Click the Browse button and locate the file that contains the destinations. 1. Open the Create a destination panel. 2. Fill in the destination information. This includes the phone prefix, the country name and the country subdivision. You can use the Description field to store extra information about the destination (for example, if it is a mobile or fixed number). Special destinations are included in a default destination set provided by PortaOne, so skip this step if you have uploaded the default set of destinations. 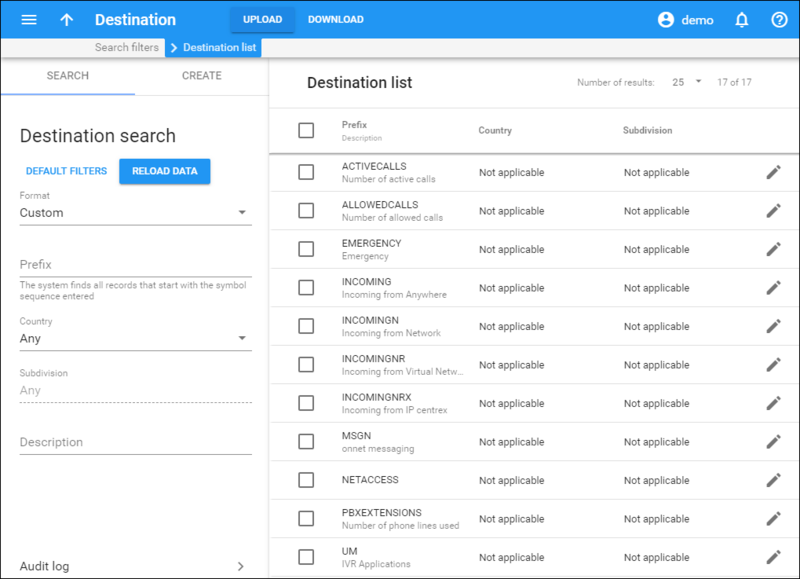 To check what special destinations are already in the system, on the Destination panel, from the Format list select Custom and click Apply filters. Sometimes you do not need to differentiate between individual destinations, all calls should be rated the same. A good example of a situation where this is required would be processing xDRs for on-net calls for your internal vendor. There is no direct cost, so you basically want every xDR to be rated at $0.0/min. One way of doing this is to create a rate for every country in the world, but a more elegant way is to use a wild-card rate. Destination | (‘pipe’ symbol) is special: when a rate is created for it in a tariff, it would match any dialed number (unless of course there is more specific rate available). Rate for this special destination covers calls made between IP phones connected to PortaSwitch® (regardless of the actual phone number). Please refer to the Voice On-net Rating section in the PortaSIP Administrator Guide for more details. This special destination allows creating a rate, which will be applied to on-net calls between accounts of subcustomers, which are managed by the same reseller. Rate for this special destination covers calls made between accounts of the same customer (on-net calls between extensions within the same IP Centrex context). These destinations are included in a default destination set provided by PortaOne, so skip this step if you have uploaded the default set of destinations. Rate for this special destination covers all incoming calls. This special destination allows creating a rate which will be applied to incoming calls between IP phones connected to PortaSwitch. Rate for this special destination is applied to incoming on-net calls between accounts of subcustomers, which are managed by the same reseller. 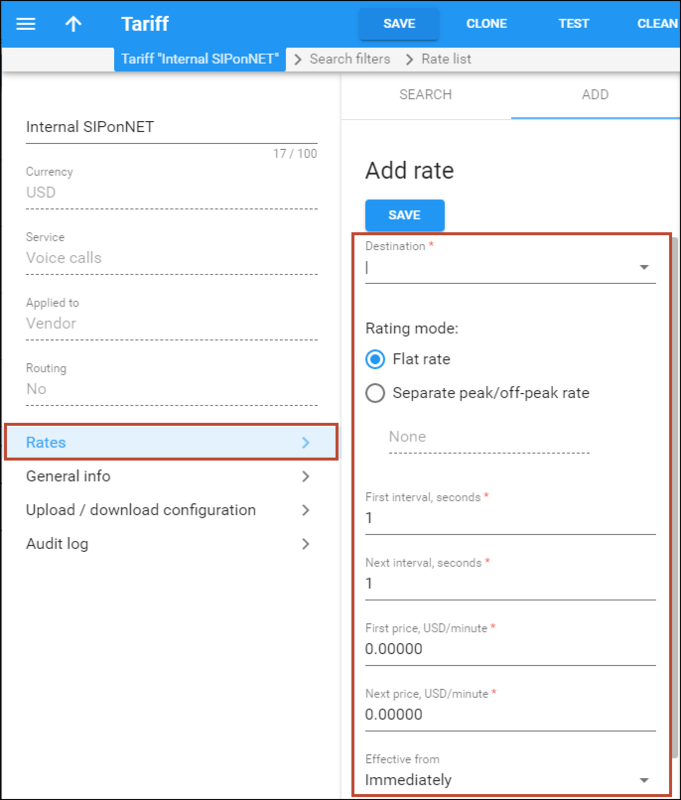 This special destination allows creating a rate which covers incoming on-net calls made between accounts of the same customer (within the same IP Centrex context). A rate for this special destination is applied for calls from IP phones to PortaSIP® Media Server access numbers (e.g. to check voice messages). A rate for this special destination is used for charging your customers for calls to any IVR application (for example, for conferencing, callback calling, balance information, etc.). Rate for this special destination is used when you offer customers a “call friends & family cheaper”-type service, when the dialed number is checked against a list of “favorite” numbers defined for each account. If a match is found, the call is rated according to a rate for the FAV destination, defined in the customer’s tariff. This special destination allows creating a rate which is used to charge your WiFi customers. This special destination allows creating a rate which is used to charge your Broadband Internet customers. 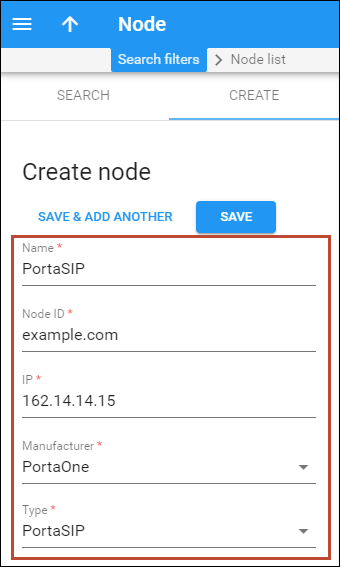 Now you have to enter your PortaSIP® servers and, optionally, other gateways as nodes. PortaBilling® requires some key information about your network equipment, such as the IP address, Node ID, Radius shared secret, and so on. Let us take a look at this example for adding the PortaSIP® node. Note that you should first configure the PortaSIP® cluster on the configuration server web interface. For detailed configuration instructions, please refer to the PortaSwitch® Configuration Server Web Reference or submit a request to support@portaone.com. · Node ID – Type the host name of the PortaSIP® cluster (recommended format: hostname.domainname). · IP – Type the visible IP address of the PortaSIP® cluster. · Type – VoIP node type. Select PortaSIP. 4. Repeat these steps if you want additional nodes to be entered into the system; for instance, if you have several PortaSIP® clusters. NOTE: When creating this tariff, make sure to disable the Routing option. · Name – Type a short name for the tariff, e.g. Internal SIPonNET. This is the name you will see in the lists. · Currency – Leave the default value here (it will be your base currency). · Service – Select Voice calls from this list. · Applied to – Select Vendor from this list. · Routing – Leave this option disabled. 1. On the vendor tariff’s panel (Internal SIPonNET), click Rates. 2. On the Add rate panel, type ‘|’ (pipe) in the Destination field and set zero as the price. Leave the other fields in the form as they are, because there are no actual costs for calls going between individual IP phones or going to voicemail. This will create a special rate that matches any dialed phone number. Vendors are your termination partners or providers of incoming toll-free lines. PortaBilling requires that every call be accounted for on the revenue side (customers) and on the cost side (vendors) and since in case of on-net calls no vendor (in the traditional sense) is involved – you will need to create a special internal (virtual) vendor, which will be used to keep the xDRs for these calls. This vendor and the connections to the vendor is a required step in order to bill internal calls properly. 1. On the navigation menu, select Infrastructure and click Vendors. · Name – Specify a short name for the internal (virtual) vendor (for example, Internal vendor). · Opening balance – Leave the default value here (0). Connections represent the point from which calls leave or enter a network and are directed to or from vendors where charges are incurred. For the initial configuration you should define 3 special connections for the internal (virtual) vendor. This is a connection that is used for SIP-to-SIP (on-net) calls. 1. On your vendor’s panel (Internal vendor), click Connections. · Service type – Select Voice. · Tariff – Select the internal vendor tariff you created earlier. · Internal – Use the slider to set this connection as internal. · Use for – Select the Route to internally registered SIP accounts (SIP-UA) option. · Capacity – Type the maximum number of simultaneous SIP-to-SIP calls you anticipate handling on the PortaSIP® cluster in the near future (e.g. 7500 simultaneous calls). This parameter is only used for correctly scaling the load graph for the connection. This is a connection that is used to provide the unified messaging services for end users. · In step 2 select the “Unified messaging services (INTERNAL)” in the Use for list. · In step 2 specify the maximum number of simultaneous calls you anticipate handling on the PortaSIP® Media Server in the near future (e.g. an average PortaSIP® Media Server handles about 700 simultaneous calls) in the Capacity field. This is a connection that is used to route calls directly to an external SIP proxy. · In step 2 select the “SIP-to-External SIP proxy (SIP-URI)” in the Use for list. · In step 2 specify what you anticipate to be the maximum number of simultaneous calls to be directly routed to an external SIP proxy in the Capacity field.